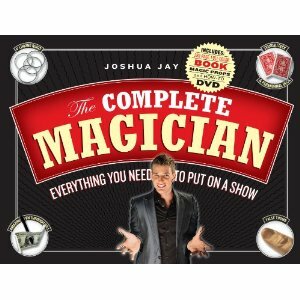 Combining a book, instructional DVD, five great props, and a sturdy, handsome case to hold it all, The Complete Magician is made for giving—an impressive, all-in-one kit with everything an aspiring magician needs to put on a show. The book is Magic: The Complete Course—“Finally, a book that brings the art of magic into the 21st century!” (Rick Merrill, 2006 World Champion of Magic)—which combines expertise, full-color photographs, and step-by-step directions for more than 100 amazing tricks. Each trick is broken down into the Effect, the Secret, the Set-up, and, most important, the Performance, with lessons on what to say, how to direct the audience’s attention, where to keep your hands, and more. The DVD demonstrates 35 tricks, showing both how to do them and how to perform them convincingly. And the props are classics: four metal 4-inch linking rings, one Svengali Deck, one Paranorma Deck, one Magic “Pen-etrating” Pen, and one false thumb tip.